This quick and easy party appetizer will be the perfect compliment to your party spread. Cut jalapeños in half and scoop the seeds out (exercise care and use gloves or throughly wash hands after). Spread goat cheese inside each jalapeño. 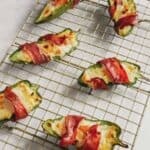 Cut the slice of prosciutto down the middle lengthwise, fold in half, and wrap around the jalapeño. Secure with toothpick so prosciutto doesn’t roll up when cooking. Place in the oven and cook for 30 minutes. Broil for 5 minutes until cheese is browned on top and prosciutto is crispy. Remove toothpicks and enjoy!